Liverpool take on Paris Saint-Germain at Anfield next week and as it stands Thomas Tuchel’s side will be somewhat depleted for this tough trip in the Champions League. According to Le Parisien, PSG have just been dealt the major blow of losing left-back Layvin Kurzawa for the rest of 2018, though in fairness they have a few options as cover. Juan Bernat has joined the French giants from Bayern Munich this summer, while Angel Di Maria could even in theory be an option as a wing-back. This makes it five players now set to miss PSG’s trip to Anfield on Tuesday, according to our friends at Empire of the Kop, who are starting to fancy their chances here. They claim Marco Verratti and Dani Alves join Kurzawa on the injury list, while Gianluigi Buffon and Adrien Rabiot are both suspended. Liverpool would dearly love to start this season’s campaign with a big win after making it to last season’s Champions League final and losing in heartbreaking fashion to Real Madrid. Despite a strong performance in the final in Kiev, two glaring errors from Loris Karius in goal handed the trophy to Real Madrid, prompting the Reds to sign Alisson over the summer. 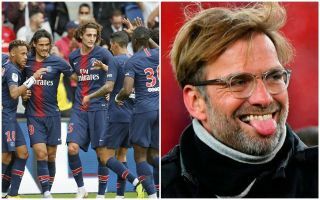 Claiming a huge scalp like PSG in their opening game this season could really set Jurgen Klopp’s side up for another fine European run.